Trips to the snow are, as we all know, actually about the eating: the hearty breakfasts, the midday break over liege waffles with cups of hot cocoa, the après-ski drinks. Every year, more than seven million people trek to the various mountains on offer in Colorado. 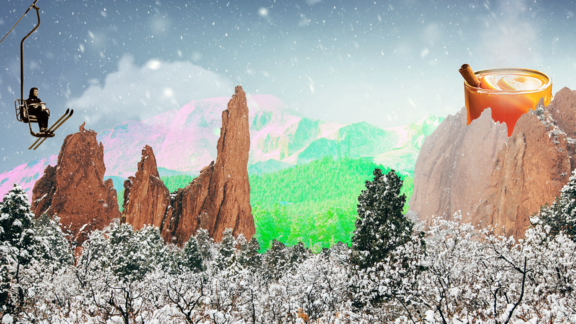 Vail, Aspen, Breckinridge, Telluride—even if you're more of a warm-weather creature, you've heard of them, because they offer some of the most beautiful views and snow in the country. This winter, if you find yourself in any of Colorado's resort towns, we've got your morning coffee and après ski covered. If you’re going to spend all day on the slopes, you need to fuel up like the world is ending and you're facing a long hibernation. And if skiing isn't your thing, or you just happen to find yourself in Colorado during the off-season, we've got you covered there, too. Once the snow melts, the mountains are lush for hiking and biking, and the lakes and rivers are ready for water sports. My very close second favorite is Beaver Creek. It's such a fun mountain—the trees, the aspen, the snow—and it's so big. There's no town around Beaver Creek, so no bars or anything. There is a lodge, but when I ski Beaver Creek, my favorite place to eat is a little sandwich shop called Craftsman. It might be my favorite restaurant in Colorado. It's this guy's [Chris Schmidt and his wife, Janelle] passion project. Chris's craft is sandwiches and meats, and then he has an affinity for Colorado beer and interesting whiskey. I'm no vegetarian, but holy cow, they make a mushroom pastrami that's so good. They listen to 70s punk a little too loud. It's just the most fun restaurant, I'm not kidding when I say it might be my favorite in Colorado. The Craftsman after a powder day at Beaver Creek might be one of the greatest days ever. Obviously, Vail is the Mecca, but everybody knows Vail, it's been discovered. But the Mountain Standard—that is so good. It's owned by the same people as Sweet Basil, which is probably some of the highest end dining in Vail. Sweet Basil is delicious and worth every accolade; Mountain Standard is a different version of it. More approachable, really fun, with an awesome wine list. I went there a few weeks ago, and got oysters, bone marrow, and big salads. The George in Vail is super fun—it's a great all-the-way-until-2-a.m. bar. Aspen is so high-end. The Little Nell has been there for thirty years or something I would guess. They set the standard for luxury up there and they do a great job. They're open year-round, too, right is really cool. My partners and I have been consulting on a restaurant there called 7908. When you're driving back down the I-70 towards Denver, you'll pass through Idaho Springs where there's a brewery called Westbound & Down that is so good. They have great beers and great food—just big salads and hot steamy chili, the things you want after being cold all day.